You're doing your own thing, just sharing the space. From beginners to advanced, 8-week sessions to teach you about ceramics. Guest artists share their focused knowledge with you. See scheduled workshops. Looking for a place to work on your pottery/ceramics 24/7? Have it fired for you at a reasonable fee? Or fire it yourself in our electric or gas kilns? Even learn to fire it yourself with free training? The Potters' Studio in Berkeley is the place, just off I-80 (Gilman Street exit). We offer an amazing opportunity for potters to do their own work using our facilities. The studio is in Berkeley, California, with lots of natural light from the sky lights and large roll up doors to let the ocean breeze in when the weather is nice. Everybody gets a personal storage cubby and additional storage units/shelves are available for rent. The open floor plan fosters an interactive community. There are always wheels available for members and table space for handbuilding. Plenty of shelving to store works in progress all around, not to mention all the equipment. We offer over 10 commercial high-fire clays here at the studio for members, and a clay recycling system to process any unwanted scraps into our studio recycled clay blend. Staff maintains the quality of 18 high-fire glazes for members to use. With training, members can mix their own glazes in our Glaze Chemicals Lab outfitted with an industrial-level air filtration system. With plenty of racks, everyone can store their works-in-progress as they dry. 8 electric kilns, 6 gas kilns (including soda and raku) with trainings available for members. 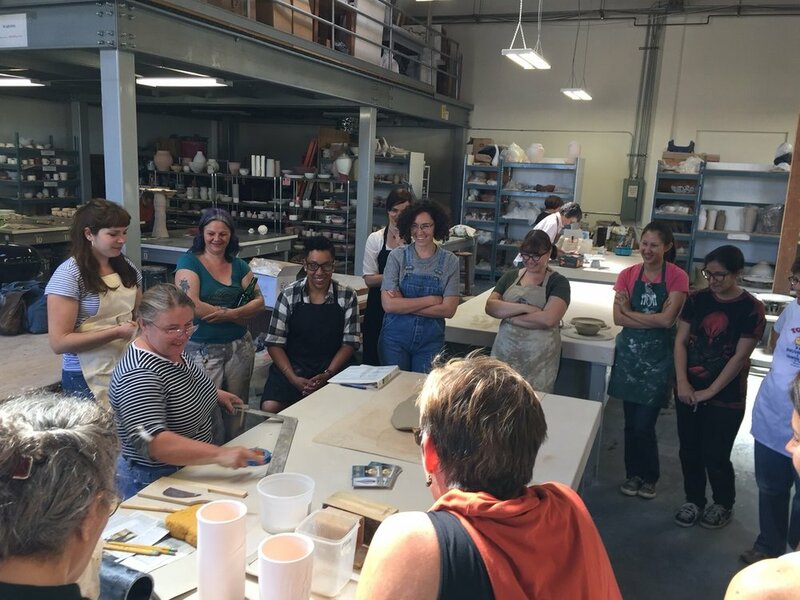 Classes at The Potters' Studio are a great opportunity to learn and hone your craft. Our classes are very popular and usually full, with notification/waiting lists. A couple of weeks before the end of a class, the current students are given the chance to re-register. The number of students opting out determines how many spots become available to new students (typically on the waiting list). From those who have never touched clay before, to those who still need guidance. For those who are comfortable with the wheel but really want to learn more. For those who are comfortable hand-building on their own with occasional assistance. Bring your ceramics here to fire in our kilns. We offer bisque and glaze firing services in our electric and gas kilns on a contract basis. We have a $20 minimum charge to fire.